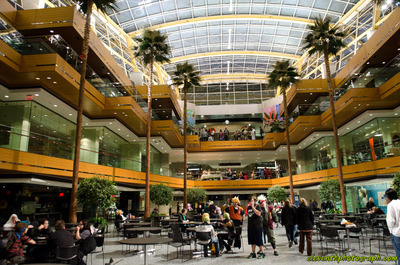 This past weekend, I attended Youmacon for my first time, which took place at the Renaissance place in Detroit, less then a kilometer from Canada. The car ride was fairly quick, only 3 hours from where I live, though we left from Toronto. My girlfriend and I did make a stop in between before crossing the border, which is where I accidentally locked my keys inside my car...I had a little trick up my sleeve to get them back easily enough. Crossing the border at Windsor was a lot speedier then I thought, luckily, then that at near Buffalo. We did however lose a dear avocado in the process... Hotel was easy to find, the staff were amazing at the Holiday inn express, may stay there again next year. The people mover (monorail/subway above-ground) was 2 minutes from the hotel and it moved people to different locations amazing I know(!). We also had a shuttle bus from the hotel which we took, convention center was about a 4 minute drive, once inside it was super confusing at first. Imagine being thrown in the enterprise randomly and ordered to find the main deck. The lack of signage was a bit troublesome, didn't help in such a multiplatform crazy location, maybe next year. Eventually things settled in and everything became vague, by the end of the convention we might have even been comfortable walking around knowing where we were going! Convention itself was decent, though perhaps underwhelming in a few areas, small dealer's room and artist alley, some tight areas, though the gaming room was pretty great, spent some time there. Shooting videos and photos across the street on the harbor/by the river was also pretty amazing, though I understand that no one with a DSLR ("Professional" equipment to be exact) is allowed to shoot video/photos on the GM property, its not like you'd know to begin with that the outside area across the street is GM property. However, I'm lucky in that my Nikon D7000 is considered an "advanced amateur" or even a "prosumer", not a "professional" piece of equipment, along with my $100 amateur tripod, my 17-55 f2.8 lens also isn't very pro, so I should be in the green. In the end, it was a pretty decent convention, supposed to expand next year, hopefully that goes over well and everyone is happy. I'll probably end up going again seeing how close it is. Check the gallery out here, photoshoots and videos will be up later.